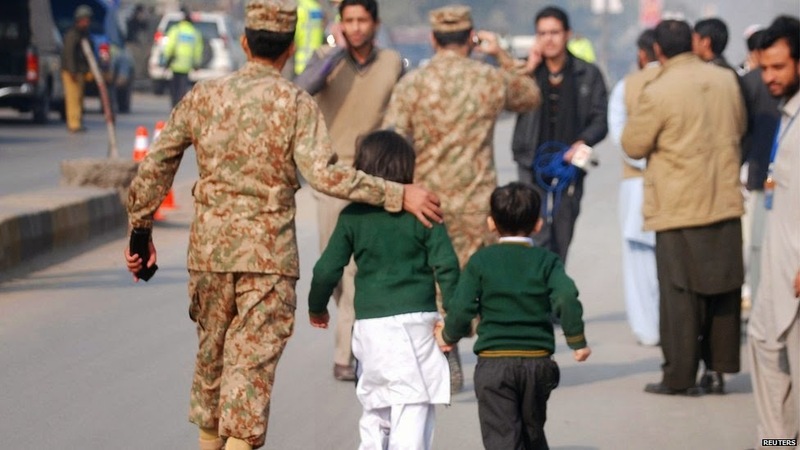 The sad deaths in Sydney following a hostage situation were bad enough, the horror that is unfolding in Iraq and Syria was horrific enough and then the devastating news today of over a hundred children killed in an attack on a school in Peshawar in Pakistan by the Taliban. I have been thinking of the children who did not come home to their waiting mothers today. Of the parents who had to identify their children’s dead bodies. Of the people who are already burying their children. Of the children who saw their friends murdered, their teachers die in front of them, who are injured and in pain now. Every mother knows the constant anxiety and worry being a mother brings with it – a child’s fever keeps us up all night, if we lose sight of them for a few minutes in a mall, our heart cannot bear the terror. So to live through what has happened in Peshawar today is unfathomable. These events have become all too common around the world and again and again we find ourselves explaining that it is nothing to do with our faith, that we don’t recognise the people who do these things or their interpretation of Islam. I can’t explain why they do the cruel things they do and really why would I be able to? This is not the faith I was raised in and embraced. The Muslim people I know don’t think or behave like this. So before the calls of “Muslims need to speak up” and “Muslims need to get their house in order” – start up as they always do (cause over one billion Muslims are a homogenous group that can be controlled and organised in a tidy manner), I’d like to be clear that the bombings, the civilians deaths, the murder of children, the intolerance of other faiths, the forced veiling of women: this is not my faith. This is not my Islam. My Islam demands that we speak up when we see something wrong, we try to put it right, we defend our homes and our families and those weaker than us, we seek justice but favour mercy. My faith offers intelligent and peaceful ways to do this. My Islam condemns the slaughter of children and civilians, it orders against the destruction of land, crops and building even in times of war and it encourages us to seek peaceful means of resolving a matter if there is an alternative to conflict. Up until today I have been confused at how people can justify these actions, even with the conflicts in Palestine, Iraq, Syria and other places as a cause for anger, I still could not see how our faith asks us to respond in this way. But today I am just angry and hurt of the continuous destruction and suffering. My prayers are with all those who have lost their loved ones: may Allah (SWT) give them the strength to bear what he has tested them with, shower them with his mercy and let their hearts find peace. May Allah (SWT) bring peace and safety to Pakistan where the people have had to suffer too much for too long. Thank you so much for sharing your thoughts. I couldn't agree more. I travel to work by public transport and wear hijab. When I see the headlines almost every day relating to Muslims, either as 'fanatics' or terrorists or victims, it just makes my heart sink. We have to speak out and condemn these acts as not having anything to do with us. I cannot comprehend the horror and tragedy of this latest attack. May Allah give those families the patience to bear the unbearable. It's very difficult for some non Muslims to get their head around all the atrocities being implemented in the name of Allah. I'm not a muslim-and the whole thing just makes me so sad. So many MURDERS using religion as an excuse for violence. Why can't people just get along?? I can completely believe that to be the case. We have heard so many horrible things since 9/11, that even those of us who love peace and condemned war and the killing of civilians started to feel guilty for being Muslims as if we had done something bad. That's why I believe its so important for people from all sides to keep educating ourselves, reaching out to others and trying to understand those that are different from us, especially as a parent who wants to raise compassionate children and hopes for a happy future for hem.